Luc, our host and local farmer, has put considerable effort into documenting several day trips based around his wonderful farm campsite. As committed fans of the viticulturists’ art, one trip that we have always been interested in but have never actually taken is to Minerve, about 50 mls/80 kms away. 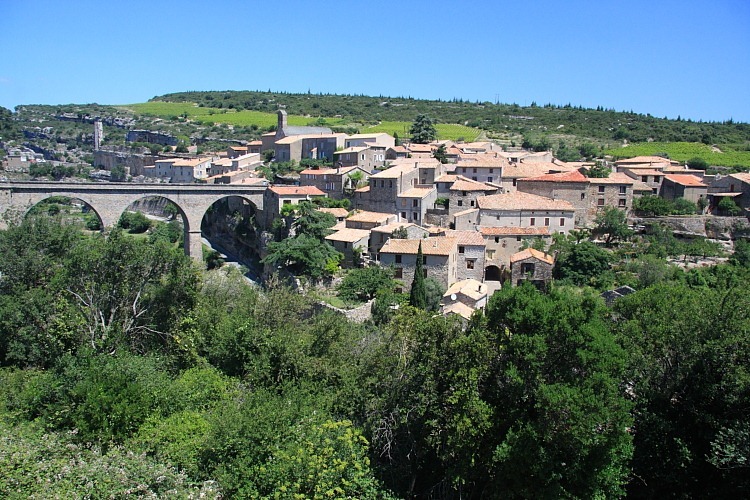 Minerve is the town that gives it’s name to the Minervois wine region and so, would seem like something of a natural habitat for us. Minerve is a classic French hilltop town with a very impressive approach down an unexpected (by me) gorge. In fact, the town is curiously positioned between the two gorges of the Brian and Cesse rivers. There’s nothing curious about the position from a defence point of view, of course, since the place must have been something of a stronghold. In practice, though, it was a not-quite-strong-enough-hold because, having turned Cathar at the beginning of the 13th century, it became a target for Simon de Montfort’s crusade and was taken after a seven week siege. The poor souls were “purified” by burning. That should do it! 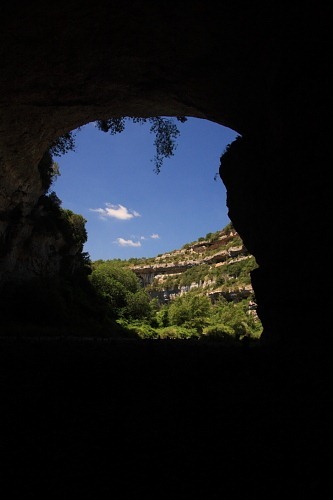 Francine and I followed signs to a pont naturel (natural bridge) which turned out to be an enormous tunnel carved through much of the surrounding rocks by the Cesse river. By enormous, I mean about 30 metres high and a hundred or so metres long – huge! The river goes underground in the dry season and the tunnel was, indeed, dry. I found that a little surprising given all the rains of late in the south of France; “dry season” was not a phrase springing readily to mind until today. Being a wine centre, we just had to get some of the precious local product to help dinner go down. What did we fancy, not too heavy in the welcome higher temperatures, to accompany chilled white wine? Our “local” supermarket came up with a splendid package of fresh mussels, ready to cook. 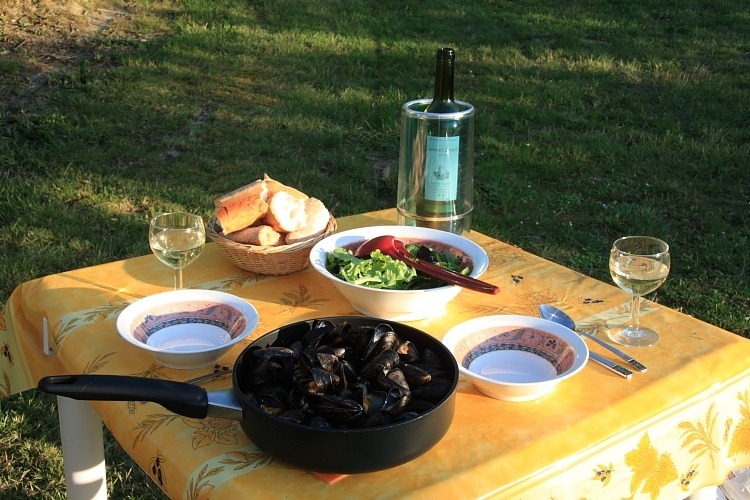 Some butter, half an onion, fresh spring garlic and moules caravanière was soon served up and washed down with some white Minervois. Excellent – and not a single mussel failed to open!